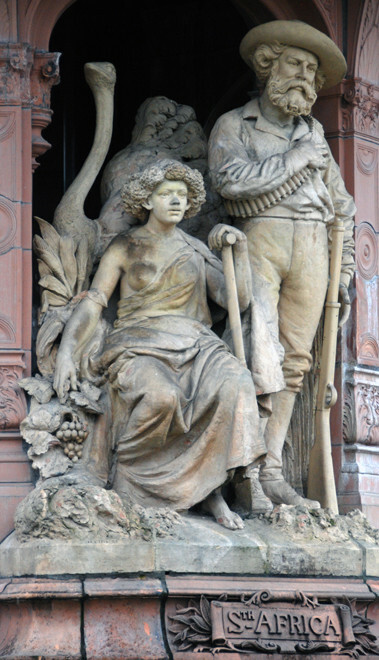 The terracotta representation of South Africa above which forms part of the Doulton Fountain on Glasgow Green celebrates the British Empire along with tableau for Australia, India and Canada. The male model for the man was used for all the tableau. The 'native' woman looks clearly like a boy from the Doulton Works with a wig on. The riches of the land are represetned by the ostrich (for the its feathers), grapes, maize, a shovel for prospecting and mining and a sturdy carbine and round of heavy bullets to shoot the plentiful game and keep order. The man is determined, benign, wistful even. The woman seated at his side, her breast uncovered to represent the 'native'at the bounds of the whilte man's civilization. In the tableau for Australia and Canada where the 'native' has been eradicated or marginalised the woman is clearly modelled on a classical Greek statue - civilization and the Roman Nose have won and conquered the land. In South Africa the struggle goes on against the Native and the Boer. That struggle is still remembered through in many UK football stadiums which have 'Kop ends'. These derive from the battle in the Second Boer War in January 1900 that took place on the hill near Ladysmith called Spion Kop. 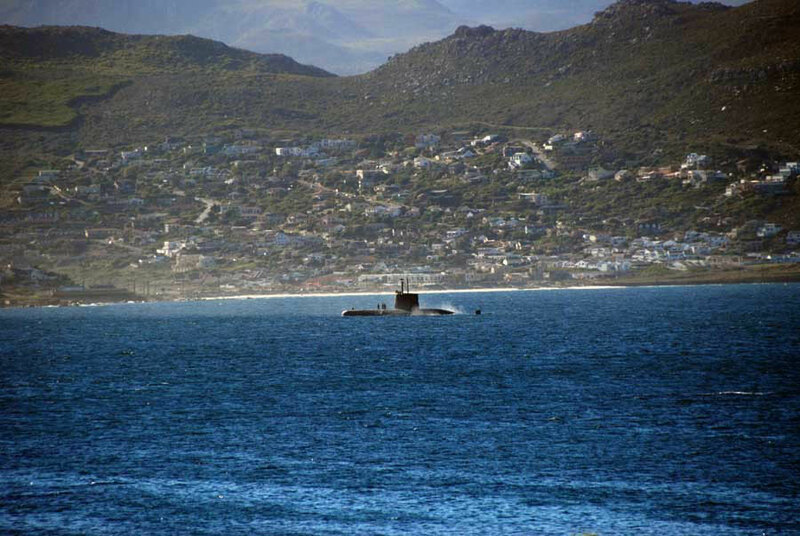 The first 80 years of British rule of the Cape colony was largely uneventful. Treated as little more than a stepping-stone to India the colony expanded slowly and was of little trading importance to Britain with the exception of the wine, wool and ivory trades. The contrast with the US is salutary: by 1870 it had 32 million people of European descent and 53,000 miles of railroad. Southern Africa had 250,000 white people and just 70 miles of railroad. Limited British immigration led to an eastern expansion of the colony into Xhosa lands and the brutal suppression of the Xhosa. In the late 1820s and early 1830s slaves were emancipated and under pressure from the London Missionary Societies the Khoikhoi were granted equality before the law - although in reality with neither political power nor access to land freed slaves and Khoikhoi were virtually enserfed to white landowners. After emancipation in the Cape Colony, as later in the United States, the forms were the forms of freedom, but the facts were still the facts of exploitation. 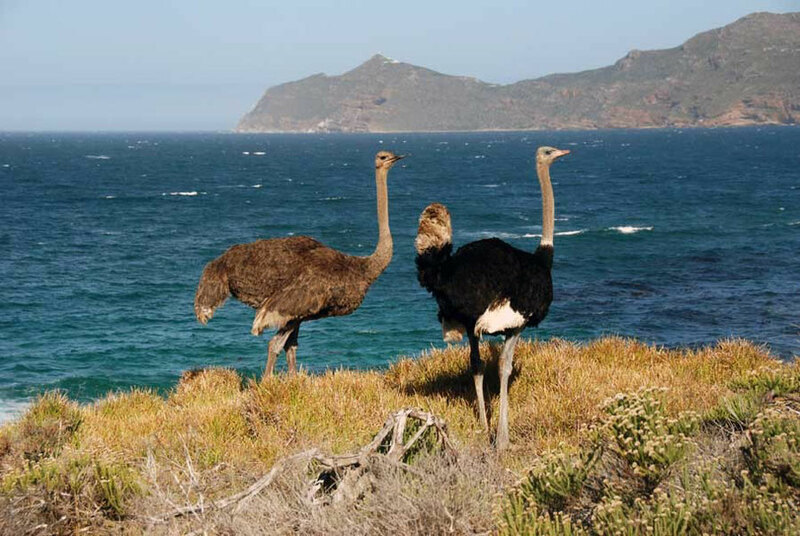 Ostrich and Cape Point behind. From this time hence Khoikhoi and freed slaves came to be called the Cape Coloured people and were to become one of the four racial categories recognised by South African governments in the 20th century - the others being White, African/Native and Indian. Rather than a gradual merging of the White Afrikaaner population and the Coloured population, further segregation was enforced through the Dutch Reformed Church's decision to separate White and Coloured congregations and the exclusion of Coloured children from schools. In 1853 Britain ceded local decision-making, subject to British veto, through a bi-cameral parliament with British officials occupying executive positions. Afrikaner discontent at slave emancipation, the use of English as the official language, and growing anti-British feeling led to the migration of 9% of the White population and their five thousand mainly Khoikhoi and Coloured servants from the east of the colony on the Great Trek, as it became known, which was led by voortrekkers (pioneers).